The American toad, or Bufo americanus, is a small amphibian belonging to the family Bufonidae. This species includes three subspecies: the eastern American toad, the dwarf toad and a rare subspecies known as the Hudson Bay toad. Taken together, the American toad's range extends from northeastern Canada to the southern and midwestern United States as far west as Minnesota and as far south as Alabama and Georgia. American toads are small, ranging from 2 to 4 1/2 inches in length. They have stout, round bodies that tend to be chubby in full-grown toads. Their thick, warty skin is usually brown in color, though skin color can change according to temperature, humidity and stress. As such, they can also be reddish, olive or gray in appearance. A distinctive characteristic is several dark spots on the back, which usually contain one or two warts each. Although you might expect to find it near ponds and streams, the American toad has a diverse range of habitats and only inhabits water sources during the larval stage and, later on, during breeding season. During this time, the toad favors warm, shallow water such as ponds or even large puddles, but can also be found breeding in shallow streams and river margins. 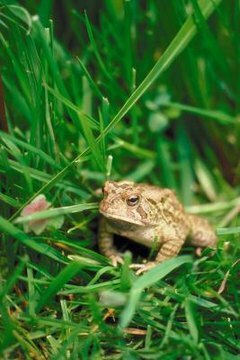 The rest of the time, these toads can be found in grassy lawns, gardens and heavily wooded areas. American toads are most active at night in warm and humid weather. During the day and in cooler weather, these toads hide themselves under rocks or fallen logs, or they dig down to hide under dead leaves and soil. In regions with cold fall and winter weather, the toad digs deeper underground, backing in and pushing out dirt with its hind feet, and hibernates through the winter, emerging in the spring for breeding season. As the weather cools, the toad's metabolism slows and it stops eating as it prepares itself for hibernation. Once it digs below the freeze line and hibernates, its metabolism becomes so slow that it no longer needs food to survive. Although they start out as herbivores during the tadpole stage, when they feed on algae, as adults American toads are carnivores who hunt insects and other invertebrates, including earthworms, snails and slugs. They tend to be heavy eaters -- able to eat up to 1,000 insects each day. While most other toad species must wait for prey to show up so they can pounce on it, the American toad has a sticky tongue that it can shoot out of its mouth to capture its prey. It can also use its front legs and feet like hands to grasp its food and push it into its mouth. Why Do Frogs Come Out After it Rains?